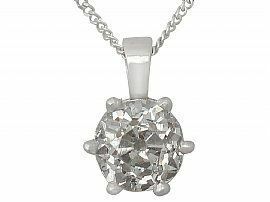 Although many adore the brilliance of laser cut modern round stones, there is a certain charm to antique diamonds which have been recycled in an incredible new piece of jewellery. 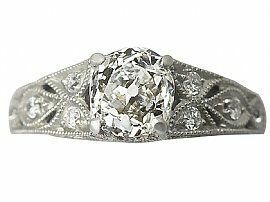 More and more customers are choosing antique diamonds. This is not only because these hand cut diamonds are distinct from diamonds which can be found at high street retailers, but also because with antique diamonds, you get so much more diamond for your money! Before diamond cutting became an exact science, dictated by dimensions which are programmed into computers, diamond cutters were simply cutting rough diamonds into the best possible shape to display their natural sparkle and brilliance. This meant that, sometimes, the diamond would be cut very deeply, with a deep pavilion. Over time, diamond cutters realised that this was not necessarily the most efficient use of their raw materials, and now it is more likely that two wider, shallower diamonds would be cut, rather than one deep diamond. Of course, some diamonds are still hand cut today, and the practice is not totally dictated by the laser cutting process. Even though antique diamonds were exclusively hand cut, they still prove to be excellent value for money simply due to the fact that they have been pre owned (meaning that we do not have to factor in the mining cost). 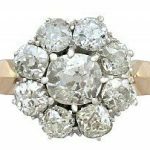 As diamonds are incredibly resilient, the pre-owned nature of antique diamonds rarely detracts from their brilliance. On the contrary, many find the fact that these diamonds carry an interesting history to be a great appeal! The imperfect shape of antique diamonds is also at the root of their appeal. The culet which features on the bottom of the pavilion is visible through the surface ‘face’ of the diamond. This culet was used to protect the diamond, which in spite of its strength was still perceptible to breakage during hand cutting at its point- the diamonds weakest area. Many of our customers prefer the natural beauty of an antique diamond, cut by hand and created by a craftsman who would have dedicated his whole life to the skill of diamond cutting. 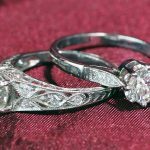 The security of a new setting – which is usually in keeping with the style of the diamond – may enhance the beauty of a diamond more than a 100 year old setting. Old settings tend to be made with darker metal and allow less light in behind the diamond. This means that the brightness and lightness of the diamond may not be displayed to its full potential. 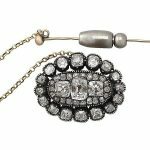 Antique diamonds can have a new lease of life within a contemporary setting, whether this is in a pendant, ring or a brooch. Often, antique jewellery was created to stand alone as one statement item. This is contrasted by the modern approach to jewellery wearing, which is to mix and match pieces, adding to your jewellery collection and amassing items which sit well together. TThe concept of wearing an engagement ring flush to a wedding band is a relatively new one. Therefore many antique rings which would be well suited to a lifetime as someone’s engagement ring may not be practical, in terms of sitting next to a wedding band. However, many new rings are created with this factor in mind, and are made specifically to sit comfortably alongside a wedding band. 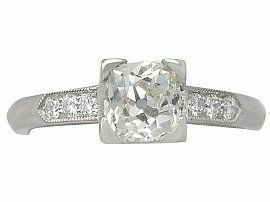 Especially when using one large solitaire antique diamond, it is likely that this piece will be bought and worn as an engagement ring. 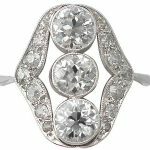 Antique diamonds in more contemporary settings also appeal to those who love the look of an antique diamond, but who prefer the idea of having a ring all their own- as opposed to one which belonged to someone else. Although a great deal of people adore antique and vintage jewellery, some, particularly with engagement rings, prefer a piece which is unique to them. Another benefit of wearing and purchasing antique diamonds is that the practice is eco-friendly. 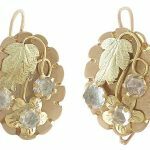 The fact that these wonderful pieces already exist in every style and type imaginable means that there is a perfect antique diamond out there ready to be worn. This could be preferable to a new piece being created, which doesn’t only cost more money but is less environmentally friendly. A further benefit of choosing an antique diamond is that a hand cut diamond will always be completely unique. By the nature of the process in which it was created, there will be no other diamond which is identical to it in the entire world! 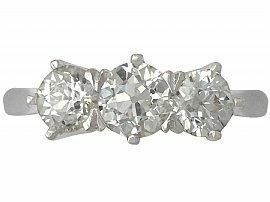 The lack of complete perfection and symmetry within antique diamonds can be a deterrent for those who prefer their diamonds modern and cut to an exact scientific formula. For those of us who appreciate the romance of an 100 year old ( or more!) diamond however, antique diamonds within contemporary settings make a wonderful choice.